So, I hope you all have guessed the mystery dish by now; yes, it was Upar gaar or Murtani, a very hot ( and I stress on the hot) choka that’s really for the brave. And of course yuh boy was in line to take a few taste of upar gaar (Murtani) for the first time with some of my sada roti. Boy was it hot! But at the same time it was tasty. What’s so tasty about pepper? I know what some of you are saying already…What’s so tasty about pepper? Well, just ask any “pepper mouth” an they will tell you. It can be all worked out quite simply based on taste versus flavour. 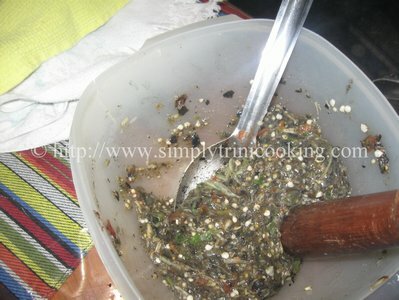 Of course anything else would be like your seasoning pepper or hybrids that have a lot of flavour and tolerable heat. So, That’s how I would break it down in a nutshell. 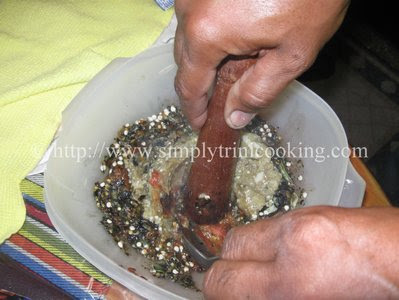 If you’re afraid of using that much pepper then use what you can tolerate but remember pepper is the main attraction in this dish. Here’s Upar gaar (murtani): hotter than ah chulha. lol. 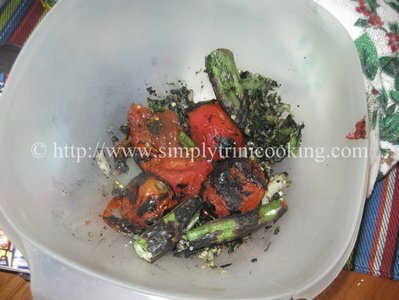 Roast the tomatoes, ochroes, garlic and pepper over an open flame. 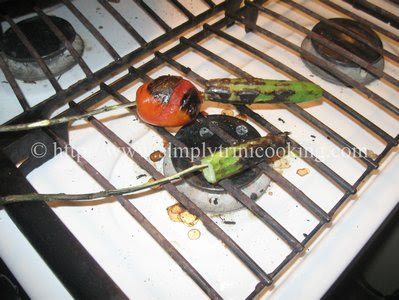 Note: As you can see we used green sticks for skewers. When roasted place them in a bowl and crush finely. 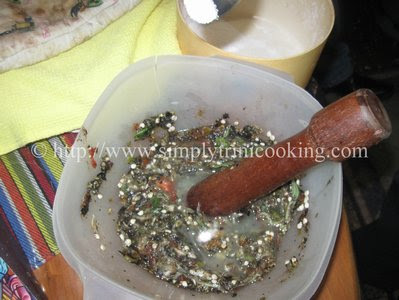 Note: You can use a small pestle to help crush the ingredients. 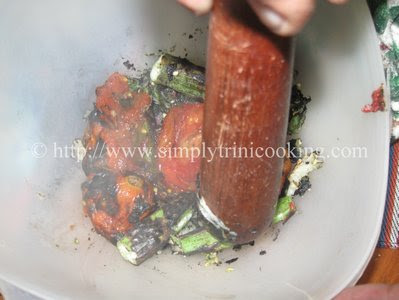 Add the baigan and tomato choka and mix. Add lime juice and salt. Mix again. 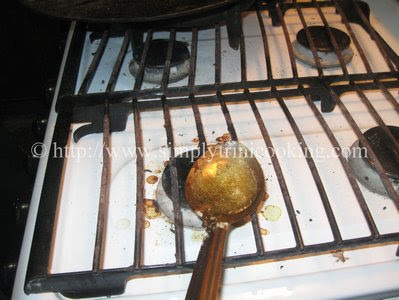 Heat the oil in a kalchul or in this case a pot spoon…. Then mix again one final time. 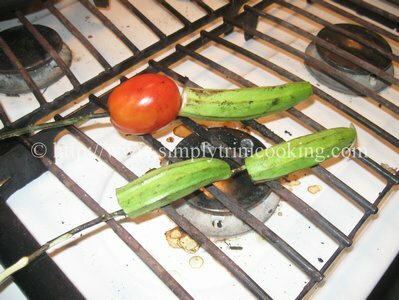 Serve hot with your favourite roti. Well, long story it was very hot so much so that my tear ducts, sweat glands, tongue, and ears got some exercise by the time I was finished with the upar gaar and sada roti. My mouth just running water at the thought of this. 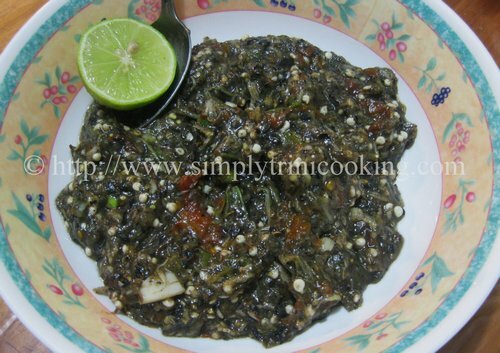 my sister makes this with the additon of roasted dasheen leaves, to die for. also i made the lime pepper sauce today, cannot wait to taste it in a week. Jade you have me in school lol I’m learning a few new things from you :-). 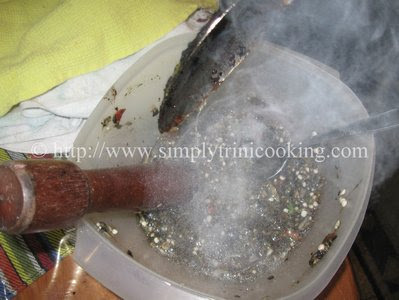 How does your sister roast the dasheen leaves…..does it itch?